Note to self: Food-coloring-pancakes look much better with white flour. The whole wheat flour just made this turn out really weird. I started off making smiley faced pancakes, and while those were cooking, I got out the cookie cutters because I was making Luke’s lunch and I wanted to cut his sandwich into the shape of a heart. (I know, I am the best.) 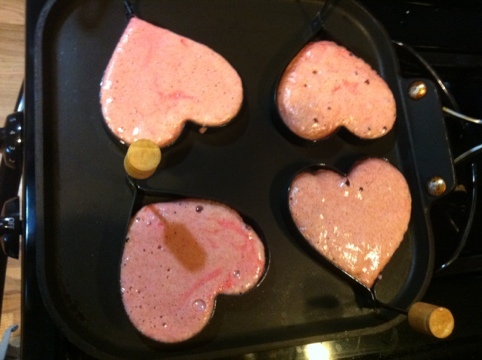 And then I found the heart shaped pancake cutters! I forgot about those! So in the mean time, I slightly over cooked the smiley face pancakes. I gave the kids the first batch off the stove and they were deemed, “sunburned on one side and really tan on the other side.) There was a lot of laughing. Then I moved on to heart shaped pancakes which turned out slightly better. They were delicious! My goal in every motherly thing I do is to create a memory that my children will look back on fondly, and the sunburned faces might do the trick. The recipe is from this book, which I love. Meta metamegan: I disabled comments for a while because all of a sudden I was getting a million spam comments. They are back on now, on new posts only. This entry was posted in food on February 14, 2012 by metamegan.